UKSSSC Notification is out. UKSSSC is recruiting for 50 Group C Posts. You can check UKSSSC - Uttarakhand Subordinate Service Selection Commission last date, download UKSSSC notification, visit UKSSSC official website and check other UKSSSC Vacancy details.Complete Vacancy and recruitment Details about 50 Group C vacancies in UKSSSC are provided below by JobSarkari.Com only for you. Last Date for Apply Online 10/05/2018. Last Date for Payment of fee through E-Chaalan / Online Mode. 10/05/2018. General and OBC of Uttarakhand Rs.300/-. SC / ST of Uttarakhand and PH Rs.150/-. Mode of Payment Application fees Can be Submitted through Online Mode or through E-Challan Making Payment at Any Branch of Bank of Baroda. Additional Private Secretary Candidate Must Have Passed Graduation or Equivalent With Typing Speed of 80 W.p.m in Hindi and English. 03. Assistant Review officer Candidate Must Have Passed Graduation or Equivalent With Typing Speed of 4000 key Depression Per Hour Hindi and English. 05. Computer Data Entry Operator Candidate Must Have Passed Graduation or Equivalent and Diploma of Computer Application With Typing Speed of 4000 key Depression Per Hour Hindi and English. 01. Supervisor Monk House Candidate Must Have Passed Graduation in Any Stream. 02. Assistant Social Welfare Officer Candidate Must Have Passed Graduation in Any Stream. 14. Assistant Teacher (Monk house) Candidate Must Have Passed Graduation or Diploma in Education / DLEd / B.T.C or 12th Pass with Minimum 50% and BLEd. 04. Assistant Minority Welfare Officer Candidate Must Have Passed Graduation in Any Stream. 15. Additional District Information Officer Candidate Must Have Passed Graduation in Any Stream. 01. Scrutinizer Candidate Must Have Passed Graduation in Any Stream. 01. Translator Candidate Must Have Passed Graduation in Hindi or English. 01. Assistant Superintendent (female) Candidate Must Have Passed Graduation in Sociology and one Years of work Experience in Any Goverment Body. 03. Total No. of Post 50. Registered Candidate does not need to register Again. Read all the Instruction before filling the form. 7. Take the printout of your Application form for Future Reference. 8. Online Application can be Submitted on or Before 10th May 2018. Q. 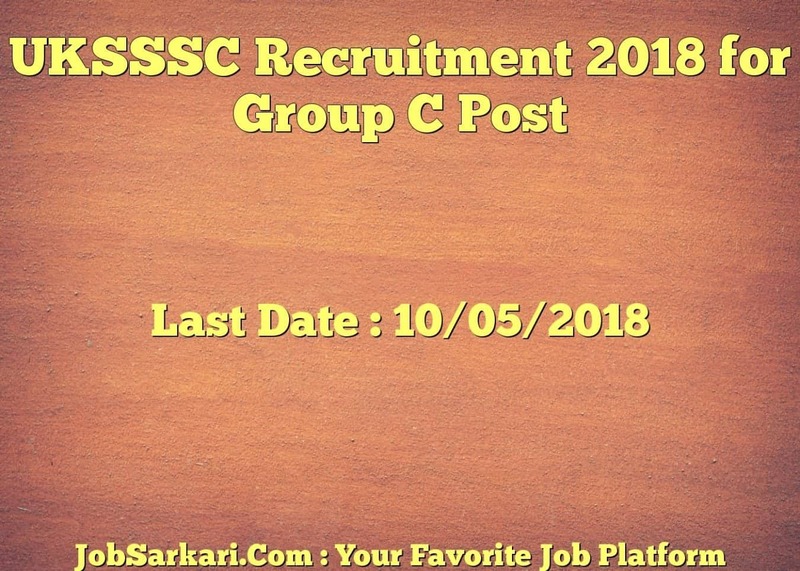 What is the Last Date For UKSSSC Group C Vacancy ? A. 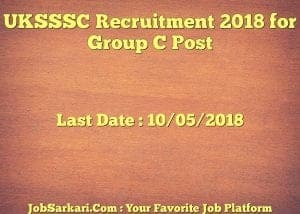 Last Date for UKSSSC Group C Posts is 10/05/2018. Q. What is the Form Type of UKSSSC Group C Recruitment ? A. The Form Type for UKSSSC Group C Posts is Online. Q. How many vacancies are available in Uttarakhand Subordinate Service Selection Commission Group C Posts ? A. There are about 50 Vacancies in Uttarakhand Subordinate Service Selection Commission Group C Posts. Q. What is the Full Form of UKSSSC ? A. Full Form of UKSSSC is Uttarakhand Subordinate Service Selection Commission .